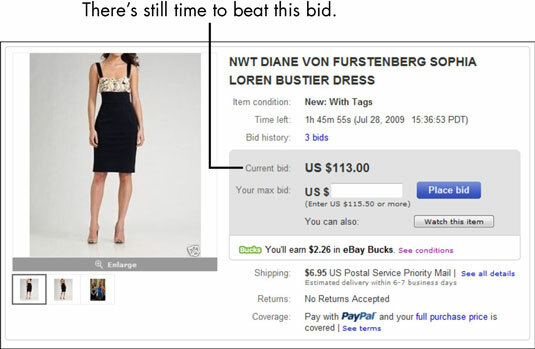 eBay offers several kinds of auctions, but for the most part, they all work the same way. An auction is a unique sales event where the exact value of the item for sale is not known. (The price is determined by how much someone is willing to spend.) As a result, eBay auctions involve an element of surprise— not only for the bidder (who may end up with a great deal), but also for the seller (who may end up making a killing). Seller: A seller pays a fee, fills out a form, and sets up the auction, listing the minimum bid that he is willing to accept for the item. Think of an auctioneer at Sotheby’s saying, “The bidding for this diamond necklace begins at $5,000.” You might want to bid $4,000, but the bid won’t be accepted. Sellers can also set a reserve price — sort of a safety net that protects them from losing money on the deal. Bidder: Bidders duke it out over a period of time (the minimum is one day, but most auctions last a week or even longer) until one comes out victorious. Big surprise, the highest bidder wins! The tricky thing about participating in an auction is that no one knows the final price an item goes for until the last second of the auction.